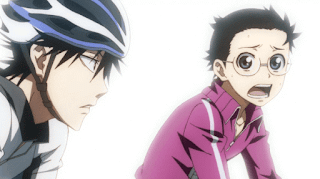 The Angriest: Yowamushi Pedal: "I Don't Have Any Friends"
It is 21 October 2013, and time for Yowamushi Pedal. Competitive cycling enthusiast Imaizumi has challenged Onada to a race up the sharp incline to their high school, because he wants to see Onada's freakish natural talent for cycling uphill for himself. To give Onada an incentive he has agreed to join Onada's anime club at school should he be beaten. Halfway through the race, it seems as if Onada has no chance - until assistance from Miki gives him the boost he needs. The majority of this episode is taken up by the second half of Imaizumi and Onada's bicycle race, which one would think would make it a pretty boring episode. As it turns out it's pretty great, thanks to some great action and a clever insertion of real-life bicycle maintenance and cycling practice. The inclusion of technical explanations for how bicycles work, why Onada's seat is in the wrong position, or why gear sizes matter makes the world of difference to the episode. Without this material it would simply be a visual attractive blend of hand-drawn and computer-generated racing scenes. Instead it's not only fascinating in its own right - animation is used to great effect to educate the viewer - it also makes those racing scenes make a lot more sense. There is a technique and a strategy, and a key part of that is in how a bike is built and set up. Knowing this gives those races that are clearly going to dominate the series more depth and drama than they would otherwise have. Characters continue to develop throughout the episode as well. It had not previously been quite so clear that Onada is completely friendless: his stresses over the school anime club being closed down are not the actions of a teenager worried about his hobby - it is actually his last-ditch attempt to find friends. It gives the character a dramatic edge than again accentuates and enhances his race with Imaizumi. The race is exaggerated for comic effect, certainly, but it was nice to see a level of realism in there as well - including within the race's conclusion. It's finale was witnessed by members of the school cycling club, which I expect will feed neatly into the next episode. Three episodes in this is a surprisingly engaging long-form anime with characters that I want to watch and a really nice combination of comedy and drama. Its quality ratio is sitting at 100 per cent. I watched the first episode on a whim - I honestly did not expect to like it this much.